After releasing a powerful joint statement expressing alarm over the human rights situation in the Philippines, a letter came the way of 39 nations encouraging them to call for the freedom of some 430 political prisoners in the country. 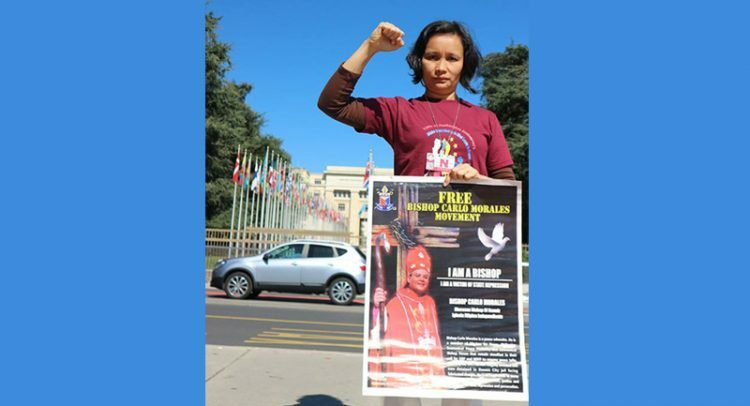 “I enjoin these States to call for the immediate release of Bishop Carlo Morales and all political prisoners in the Philippines,” said Maria Teofilina Morales, wife of the Ozamiz diocesan bishop of the Iglesia Filipina Independiente, in an open letter that welcomed the united stance. The statement, which also encouraged “safe spaces” for human rights defenders, among others, was read by Iceland on Sept. 28 at the 36th session of the United Nations Human Rights Council in Geneva, Switzerland. Morales was also in the city as a member of the Philippine UPR Watch delegation to the Universal Periodic Review. In her letter, Morales said her husband has been detained since May 11, with National Democratic Front peace consultant Rommel Salinas. She said her husband was an advocate of the peace process and environmental justice. She also called on the 39 states to discontinue assistance going to the Philippine National Police and the Armed Forces of the Philippines, the parties involved in issues of extrajudicial killings and militarization. I am Maria Teofilina Morales, wife of The Rt. Revd. Carlo Morales, Bishop of the Diocese of Ozamis of the Iglesia Filipina Independiente (IFI), a member church of the World Council of Churches. I was with the Philippine UPR Watch, a delegation of victims of human rights violations, ecumenical leaders and human rights defenders, that participated in the recently concluded Universal Periodic Review on the Philippines in Geneva, Switzerland. My husband has been in prison since May 11, 2017 on trumped up charges lodged by the state security forces to justify his illegal arrest and detention. I was arrested with him on that day, along with Isadome Dalid, IFI Diocesan driver and Mr. Rommel Salinas, peace consultant of the National Democratic Front of the Philippines (NDFP). We were denied counsel during the first few hours of our detention. I and Mr. Dalid were freed a day after. Our daughters are gravely affected by this incident. They hope that they will be reunited with their father at the soonest time. At present, there are 430 political prisoners in the country. There were also 848 cases of illegal arrests under the government of President Rodrigo Roa Duterte. During the start of his term, President Duterte promised to release political prisoners, but majority of them are still languishing in jail and their numbers are increasing. Bishop Carlo is a known peace advocate especially in Mindanao (the Southern part of the Philippines) and has been active in the Philippine Ecumenical Peace Platform, a network of church leaders in our country advocating for the peace negotiations between the government and the NDFP. He is also a strong advocate for a safe and healthy environment, in particular in the defense of indigenous communities against mining and other projects that endanger the lives of the indigenous peoples and national minorities. His continued detention is a form of harassment and is meant to deter other human rights defenders in continuing their work. *The 39 Member States of the UN HRC recently released a Joint Statement on the Philippines. These States are: Australia, Austria, Belgium, Bulgaria, Canada, Croatia, Cyprus, Czech Republic, Denmark, Estonia, Finland, France, Georgia, Germany, Greece, Iceland, Ireland, Italy, Latvia, Liechtenstein, Lithuania, Luxembourg, Macedonia, Malta, Moldova, Montenegro, Norway, Poland, Portugal, Rumania, Slovakia, Slovenia, Spain, Sweden, Switzerland, The Netherlands, UK, Ukraine and United States.